Dave Rowe, general manager at Mid-States Wool Growers Co-op. CANAL WINCHESTER, Ohio — A dead cat, a basketball and a snake. Those are some of the most unusual things Stanley Strode has found in bags of wool in two decades of grading wool for Mid-States Wool Growers Cooperative Association. 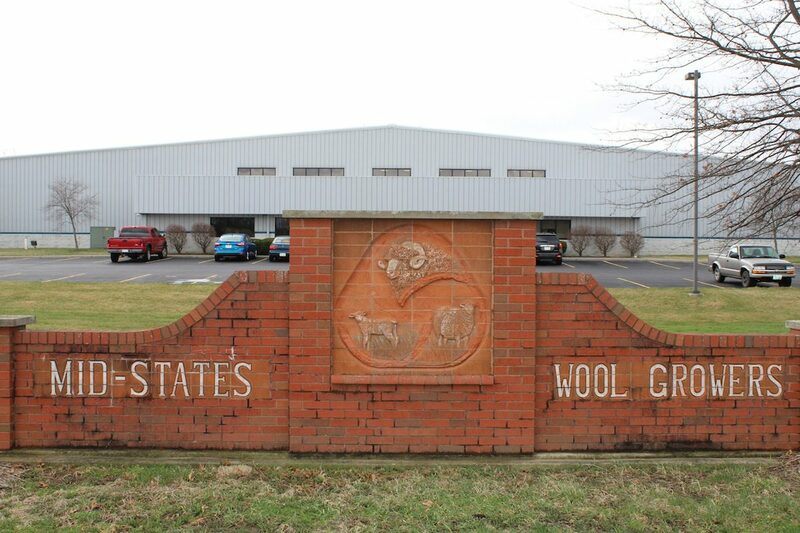 Strode is a wool manager for the co-op, which welcomed a group of Amish sheep producers to its central Ohio warehouse and grading facility April 4. He spoke alongside General Manager Dave Rowe, about the importance of producing quality wool that is clean and free of foreign elements. “The cleaner your wool is, the higher yielding it is, the more valuable it is,” Rowe said. Strode said what happened in these cases is, the wool was bagged before it was graded, and these things got mixed into the bags along the way. 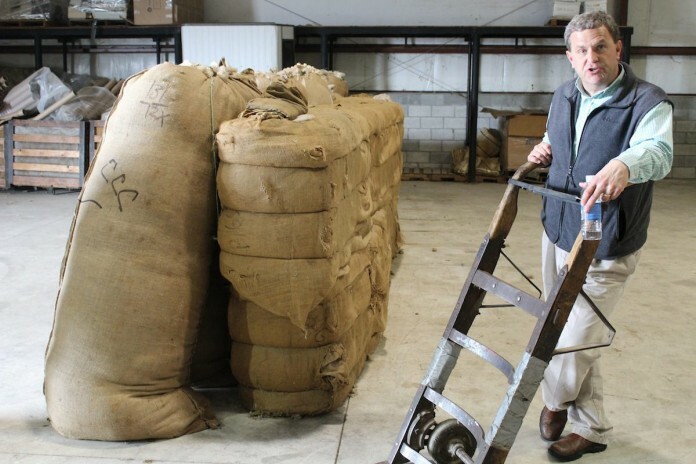 He said if producers want the most money for their wool, they should usually have it graded before it’s bagged, so the buyer knows exactly what’s inside. More common foreign elements include dirt, grease, oils and vegetative matter. All of these things reduce the value of the wool, which is baled at the warehouse and sold to wool mills in the United States and overseas, where it is manufactured into clothing, blankets and other things. The co-op works by buying farmers’ wool — either on the farm or at the warehouse — grading and sorting the wool — and selling it to top buyers. 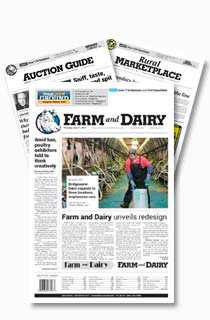 Depending on the type of marketing the farmer chooses, he can be paid the day he sells it, or at the end of the year, after the wool is sold through a consignment process to various buyers. Strode and Rowe were the featured speakers at an Amish Wool Management event, designed to help Amish producers get more money from their wool. For most sheep producers — the lamb sales — not the wool — is the primary reason they raise sheep. 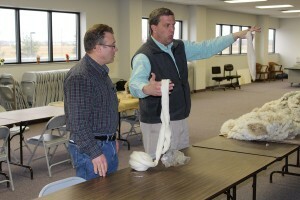 But the wool can be a valuable source of income and add some profitability to the operation, Rowe said. 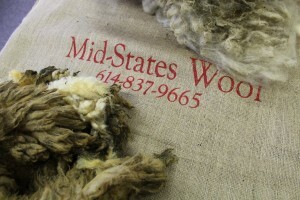 The wool is graded on its microns or how fine it is, its strength, cleanliness and yield. The finer, cleaner and stronger the wool is — the more money farmers are paid. Some major issues are wool that contains hair, including sheep hair, and wool that is wet or contains poly-contaminated materials, such as plastic from bale string. Just one small piece of contamination can ruin a garment, and greatly reduces the value of the fleece. 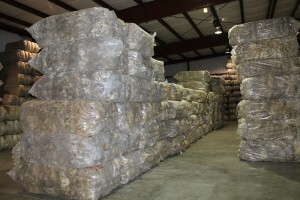 The warehouse, which was built in 1995, consists of three basic parts: The unloading room where new product enters, the grading and baling room, and lastly, the warehouse where bales of wool are stored, weighed and sold. 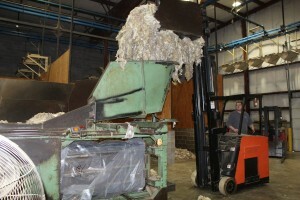 Wool is brought to the warehouse in burlap as well as clear plastic bags. Both are acceptable, but the clear plastic has the advantage of allowing graders to see what’s in the bag, and eliminates contamination from the burlap. The wool moves along on a system of belts and conveyors, where it is graded by human eyes and hands. Drew Cable, a grader from Hebron, operates the grading station. He works from an elevated platform 20 or so feet off the ground floor, stopping each pile of wool on the conveyor to give it a visual and hands-on inspection as it moves through the system. Grading is an art and a science both, and in a day’s time, he figures he grades about 10,000 pounds of wool. The work can become tedious at times, but it’s what Cable enjoys. 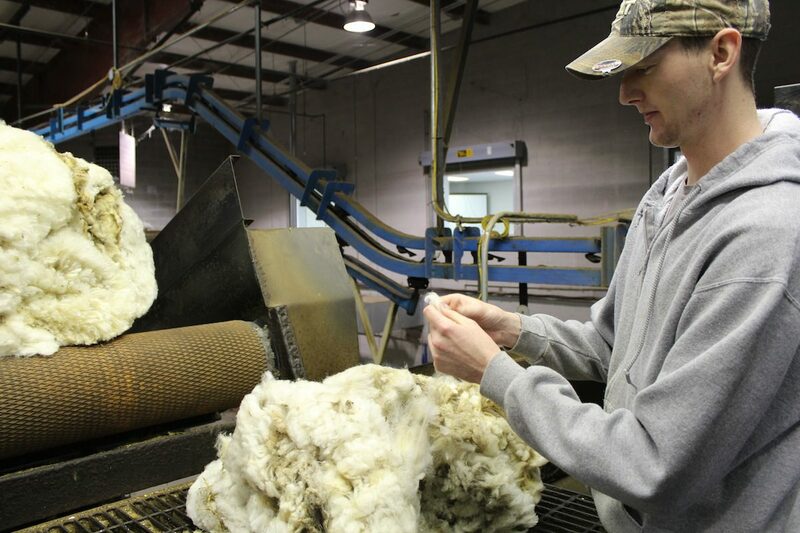 He occasionally takes a break or gets to do a different job, but for the most part, his job is to grade wool. It helps, though, having experienced guys like Strode and Rowe giving him advice. 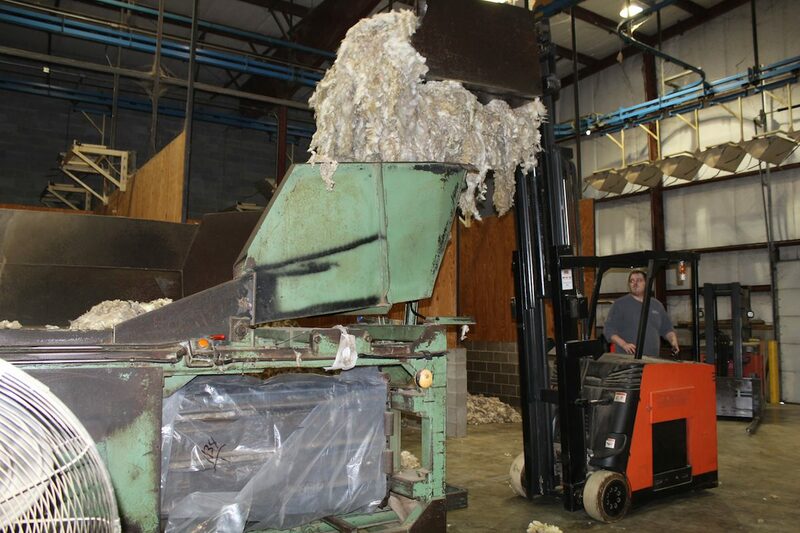 After the wool is graded, it’s mixed and piled into a holding dock with similar-grade wool, before it is compacted and baled for storage. Each bale weighs 600-650 pounds and is wrapped in clear plastic, making long-term storage possible and allowing the co-op to handle and store a large quantity of wool. In a year’s time, the co-op produces about 2,900 bales. The bales are trucked from the plant to the wool mills with 72 bales making a full semi load. In addition to a weigh sheet for each bale, the bales are also core sampled with a large metal probe, and the cores from each bale are provided to the buyer. This allows the buyer to purchase product without actually visiting the plant, and to be sure of what he or she is buying. 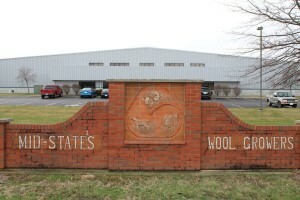 The majority of the wool is shipped to a wool mill in Charleston, S. C., but shipments are made to other mills, as well. Because the co-op is the easternmost facility of its kind, it enjoys a close proximity to the East Coast markets and exports. Most of the product is sold domestically, but some does get shipped overseas. The Amish men who attended the tour had the chance to walk through all parts of the factory and ask questions. Vernon Miller, who raises about 90 ewes near Sugarcreek, said he’s planning to expand his operation and wants to do so in a way that will produce “a tolerable rate” of return. Miller said some of the tips that were discussed on the tour — about nutrition and cleanliness — could help add value to his sheep. He anticipates that some of his wool will be marketed through Mid-States in the near future. Crist Byler, a sheep producer from Noble County, said he was mostly there to get ideas for improvement. One thing that stood out, he said, was the evidence that genetics play in leading to finer quality, finer micron wool. The producers were shown different fleeces from different breeds of sheep under different management styles, and encouraged to touch and inspect each fleece to notice the difference. 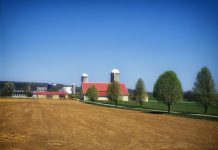 Roger High, executive director of the Ohio Sheep Improvement Association, said the program was part of a larger effort the association has undertaken, to reach out to new and beginning producers, especially Amish. High said it’s unclear how many sheep the Amish have, because they don’t participate in the state statistics collection program, but he said they have the land and resources and are primed for success. 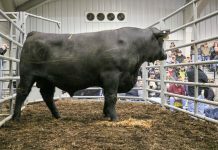 “That’s where the sheep industry is going to expand,” he said. Even if producers can change just a few small things, and add $3-$5 to the value of a sheep, High said it helps them stay in business and be profitable. That, in turn, “helps the whole infrastructure,” High said, by supporting families, the livestock markets, and the state’s sheep numbers. Good nutrition: The nutritional level of the sheep throughout the year affects staple strength. 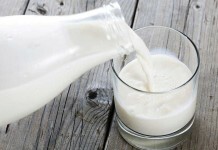 Reduced feed intake or excessive worms can cause a weak spot or general weakness in the fiber strength. Keep your ewes in a body condition of 2.5-3.5 throughout the year. Shear before lambing: Staple strength is affected by physical stress on the sheep, especially at lambing. 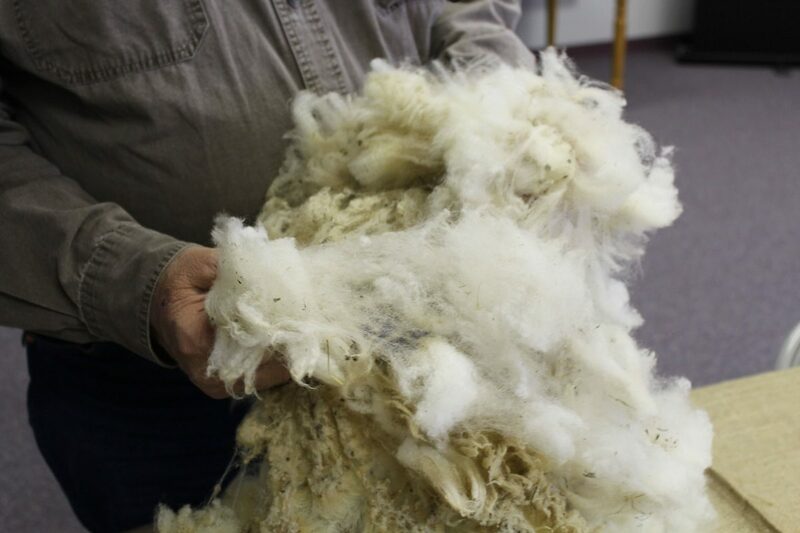 A fever at lambing can place a break in the fiber, which causes the wool fiber to break, resulting in two pieces of fiber that are less than 3 inches. The solution is to shear the sheep prior to lambing. If a break occurs, it is at the end of the fiber and creates no problem in fiber length. Clean fleece: Excessive vegetable contamination of the fleece is caused by weedy pastures or the barn feeding system. 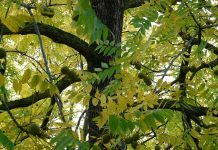 If your pastures have weeds, cockle burr, or seed heads, this will cling to the fleece and lower its value. Secondly, the vegetable matter could be coming from the barn feeding system. Your feeders could be allowing the sheep to stick their heads into the hay and contaminate the fleece with hay chaff along their neck and back. Clipping pastures or shearing before the ewes come to the barn for winter feeding will reduce the amount of hay chaff and contamination. 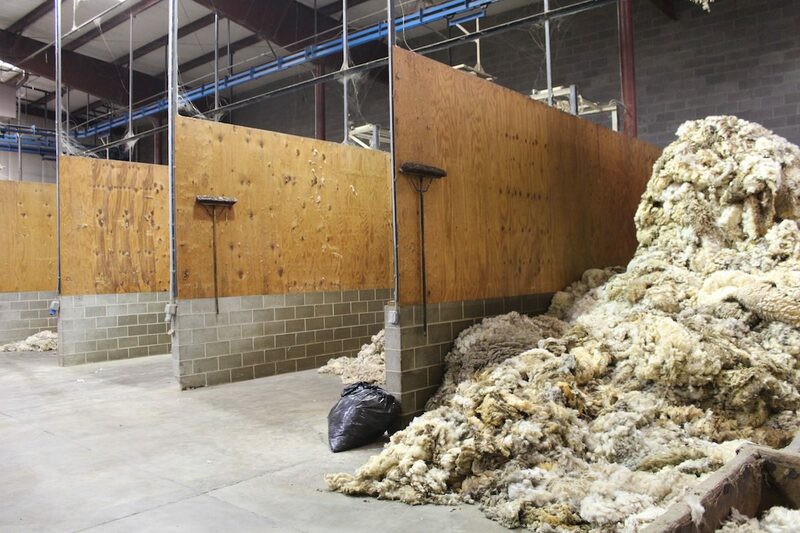 Bedding material: Good management needs to occur before the shearer gets to the farm. Don’t bed the barn the night before shearing is to take place a this will cause straw to cling to the wool and ruin an otherwise useful clip. Clean straw in the wool is also a sign of poor management. Shear dry sheep: Never shear wet sheep. The wool will be ruined and can’t be saved. Even a little dampness will allow wool to turn yellow, stain and form mildew. Keep the shearing floor clean: Sweep up tags and bellies and bag them separately. Sticking them in the middle of the fleece to try and hide them lowers the value of the entire clip and contaminates the wool. Buyers know that all sheep have belly wool and tags. Bagging it separately and marketing it for what it is allows the buyer to pay you the maximum value of your entire clip. Bag strategically: Bag wool one fleece at a time so it can be graded. The preferred packaging material is clear plastic wool bags. This eliminates the burlap contamination common in the old burlap wool bags. Never bag wool in plastic feed sacks. This contaminates wool with polypropylene and this can not be separated completely at grading, which will ruin a total piece of the final fabric. Improve genetics: For further improvement, a producer should consider the genetic makeup of his sheep and whether changing genetics would improve the fiber diameter (micron) of the wool. A finer diameter is usually more valuable.